Donald Trump’s illegitimate Acting Attorney General Matthew Whitaker is the kind of guy who runs a scam involving scam toilets and gets caught. He’s the kind of guy who can’t get through a press conference about Chinese cellphones without sweating gallons and blurting out a confession to obstruction of justice. Now he’s about to really be overmatched, and he’s admitting he knows it. Matt Whitaker is facing a no-win situation. He can show up and testify honestly in front of the television cameras for the House Judiciary Committee on Friday, alienating Donald Trump in the process. Or he can show up and commit perjury while trying to protect Trump, which will get him sent prison. Or he can not show up, which will put him in contempt of Congress, which will land him behind bars. 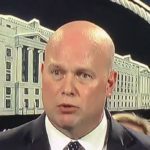 Now something about Whitaker is leaking, and we’re not talking about sweat. Someone in the Department of Justice has leaked to CNN that Matt Whitaker is “undertaking significant preparations” for his testimony on Friday. Wait, what does that even mean? He’s finally studying up on what an Acting Attorney General is supposed to do? He’s memorizing answers that aren’t technically perjury? He’s doubling down on deodorant? And who would leak this strange story about him, anyway? What’s the point? In any case, someone out there wants us to know that Matthew Whitaker is working really hard at preparing himself for his testimony on Friday, which is usually a sign that even Whitaker knows he’s about to get ripped to shreds. Did we mention there will be live television cameras involved? They should sell tickets to this thing.